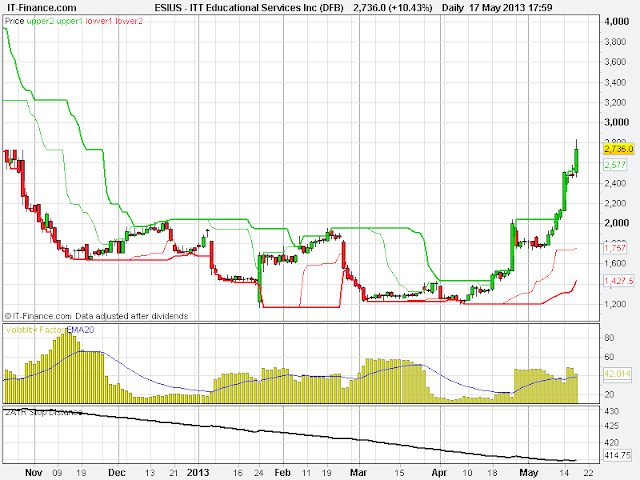 Below is the chart of US stock ITT Educational Services ($ESI) in which I opened a position only last Friday. As you can see, this has been a text book initial breakout and trend upwards, with a couple of big 'up' days during the course of this week. The most pleasing thing to me is that, I did not select this trade - one of the guys in the mentoring programme alerted us to it as a potential set up via Twitter. I actively encourage the members to tweet potential set ups like this to keep an eye on or to discuss, as not everyone in the programme has access to their charts and scans all day, every day. Obviously, not all trades quickly develop moves such as this, but they are using their knowledge to look for the set ups offering the most potential from a trend following perspective. Therefore, by having access to this twitter feed we can alert each other to potential trades like this in real time. Using twitter in this manner is not solely so that I give them my own signals, but its principal aim is to act as a discussion point and an educational tool. This all helps to speed up the members' development. I will be more than happy if they keep picking set ups like this. If you are interested in joining a small focused group of traders keen to learn trend following, then consider signing up to the mentoring programme.